Well, sadly, today was our final day of fire prevention discussions. We reviewed our smoke detector, fire extinguisher, and fire drill. After our review we added some new material. Our focus was first on firefighters today. I have a big picture of a firefighter with all his gear on. We used to be lucky enough to have visitors from our local fire company, but time restraints for them have made that impossible lately. So. we take a look at our firefighter--what is he wearing, why is he wearing that, what is the ax for, is there something covering his face? I pose these questions to the children and we discuss all the clothes he has on for safety purposes. That he carries an ax because sometimes doors are too hot for him to touch is important too. The big thing is that mask. Our firefighters used to want us to stress the importance of never running from a firefighter. Because firefighters have on so much gear and that mask covering their face making a funny noise, many children are afraid of them. So we discuss all these things and stress the importance of how helpful and kind firefighters are and we shouldn't be afraid of them. 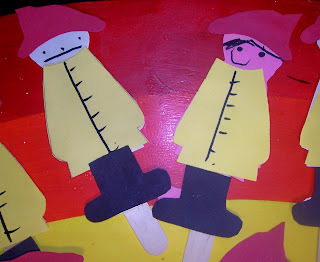 Our craft today was a firefighter stick puppet. Now, I know, he is very minimal, but I have never claimed to be an artist. Also, you can see he doesn't have a mask, but I didn't want to stick a black rectangle over his face. The kids love these. I am always amazed how the simplest of activities are the most enjoyed. They love making them talk and moving them around. I also find when doing this craft is is very interesting to see where the children place the different items of clothing. It's funny how many of them have no idea where to put the shoes, or hat, and the coat is occasionally on sideways or upside down. 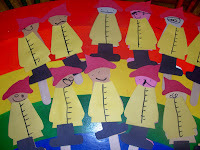 For the project I had all the pieces cut out--a body shape, a coat shape, boots, and fire hat. 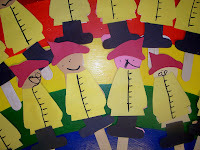 I gave the children the body shape and asked them to dress the firefighter. They glued on the pieces and drew a face--pretty great faces too for this time of year I must say. I glued a tongue depressor to the back and they were good to go. Our final fire prevention discussion centered on crawling under smoke and stop, drop, and roll. Did they learn these? I'm not sure they get so silly because we pretend were crawling around under the smoke and all the giggling starts. Then we walk around and pretend there is fire and --STOP! DROP! and ROLL! Again, giggles galore. So there you have it. A quick look into a quick week of Fire Prevention. I love those stick figures! Very cute ideas!